Ronald H. Brown (1941-1996) served as the first Chair of the UDC Board of Trustees, following the consolidation of D.C. Teachers College, Federal City College and Washington Technical Institute in 1977. At this time, he also was Deputy Executive Director for Programs and Government Affairs of the National Urban League (1976-1979). Brown served under President Bill Clinton as U.S. Secretary of Commerce from 1993 through 1996, the first African-American to hold this position. 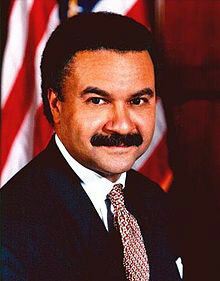 Subsequently, he was elected chair of the Democratic National Committee, in 1989.